Two years ago at Midwest Haunters Convention some of my crew went on the bus tour and saw a haunt in Cincinnati called the Dent Schoolhouse. They were blown away by the detail and the “creepy janitor” that lurked throughout the event. That same year Tim May of Dead Acres/Haunted Hoochie fame told me how much he loved the place and how the “janitor’s bedroom” was one of his favorite haunted house scenes. I was starting to get very curious! What was the Dent Schoolhouse and who was this janitor character? Soon enough I would find out about this amazing attraction, an event on the fast track to haunted house fame run by a crew who were making all the right moves! The Dent Schoolhouse was once an actual school, but over the years it served as a home for several different businesses including a machine shop and a dry dock. Then for many years it became a haunted house run by the local Boy Scout troop, until 2005 when they sold the place to Bud Stross, Josh Wells and Chuck Stross. 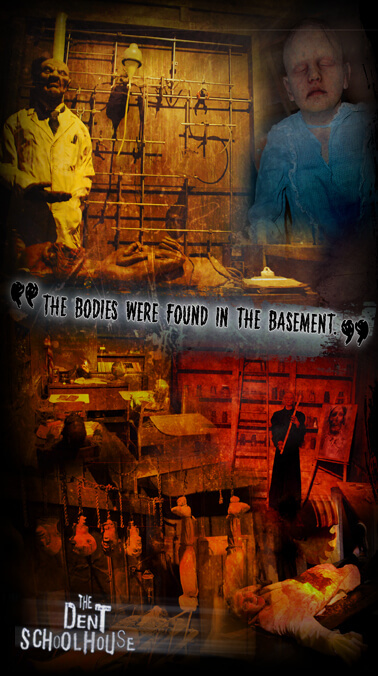 Formerly home haunters, the team had spent several years planning the leap to pro haunting and had attended many shows and seminars in preparation for opening an event. When they built this haunt they really had a clear plan in mind and it showed: create a very tight theme weaving the building and the design of everything from the scenes to the marketing into one cohesive story. In route to the Midwest Haunters convention last year I had a chance to stop by the Dent Schoolhouse and I was very impressed by both the haunt itself and the amazing amount of props and antiques they had amassed. As the story goes, Charlie the janitor was responsible for the disappearances of MANY children, and in 1955 the bodies were found in the basement. The vast collection of props they have gathered to tell the tale can be grouped into 3 categories: items that say SCHOOL, items that say 1955, and items that say HORROR! A tour of the place begins in a small overgrown outdoor graveyard and passes by a real school bus. Then it is into the creepy boarded up building to begin exploring Charlie’s world. Like most schools this starts with a trophy case and then you head to the nurse’s office, featuring medical posters, some surgical gear and a Bucky skeleton used for once as it was intended to be - as an apparent teaching tool! The rest of the first floor continues with a series of classrooms. A biology dissection scene with a creepy professor working on a mutilated piglet and a gruesome cafeteria with some cannibal treats stuck out for me. The detail is exceptional with very high walls, exposed lathe, chair rail, excellent paint washes and other signs of age and deterioration thrown in. Everywhere are thousands of detailed props you might expect in a school, featuring books, globes, knick knacks and other bits of period decorations. While many of us are into collecting BIG items this place is chock full of the little things - old bottles, boxes and tins of products from the 50’s, old photos, anything to set the mood. An art class features grim drawings of corpses as if the kids were into some really twisted anatomy studies, and a hanging girl over a stairwell also helps to keep the gory aspect at the forefront of the guest experience. I also liked the use of chalk boards to help tell the story. One had a sentence repeated many times about not bugging the janitor - obviously the kids didn’t follow that advice! My favorite area of the haunt was the actual basement, Charlie’s lair. The top floor had very tall walls, maybe 14 feet or so, but the basement is low and tight. The outer walls are real stone, and actual rusted pipes and electrical boxes blend in with the ones placed there by the set dressers. This level features a maze of shelving units with old motors, chains, car parts and other industrial type equipment. The work benches are FILLED with this sort of stuff, endless tools and other actual aged equipment, all of it covered by a fine tracery of cobwebs and dust. A boiler room in this setting seems absolutely authentic but it was in fact built for the haunt. Things start to get very nasty as we begin to discover the victims, parts of them savaged and strewn about various workrooms, hanging from hooks and chopped to bits. The ultimate horror is Charlie’s bedroom, a small nasty room, with a foul disheveled cot illuminated by an old TV set as the sounds of old radio music fill the air. The room just feels evil, and provides ample places for the actor playing Charlie to get a great scare! The building is much larger than it at first seems as a vast area in the back extends the floor space enormously. Here the rooms expand in size, one of the first being a rather large auditorium full of seats and prom decorations. One of my favorite scenes in this section was the garage featuring an actual car, with a poor victim shoved in the trunk. The tools, the car parts, the walls of old license plates are just cool, hundreds and hundreds of props in just one room. The space is well used as you wind around the garage though a series of chain link partitions. I was amazed at how much work went into securing these props to the various surfaces, most of which are located where the public can touch them. Often VERY fine wires wrap almost imperceptibly around them creating a firm anchor but giving the illusion of being casually tossed down by a mechanic. From this point on they bend the theme EVER so slightly to allow other sorts of designs. 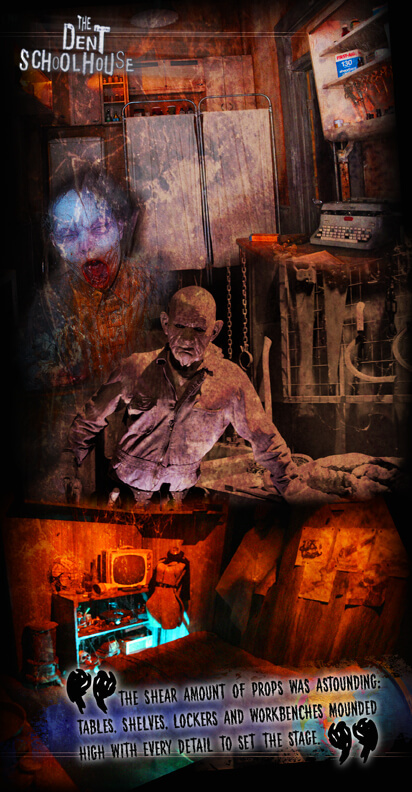 One is a lab sequence with lots of ornate glass ware and scientific equipment and an asylum/ hospital area featuring old medical props and intense Unit 70 style gore and animations. Then comes a sheet maze and a rather extensive clown scene. This is worked into the theme by signs and posters describing the “school carnival” that is now in progress. Several extensive clown areas are presented, including a big top area, a freak show and a very well done series of carnival games. Clown figures are everywhere creating a great scenario for hidden actors to blend in. This leads to some big effects that fit the theme such as a squeeze tunnel and vortex, always favorites with haunt patrons. When you think the place is finished there are always more scenes, then finally you head outside to a dilapidated shack / hick area for the final chainsaw chase. The scares in the haunt take many forms, but they have certainly mastered the art of drop panels, slide doors and other forms of actor concealment and sudden appearance. Dent has several overheads where the actors open shutters and attack from above to really let you know that nowhere is safe. Animations are also spread throughout the event, primarily human sized figures sure to startle the patrons and give the actors ample distraction to strike! Overall this show was extremely well executed on every level, but the two components that really stood out and complemented each other were the total dedication to a theme, and the collection of antique props, perhaps one of the biggest collections I have seen in a haunted house. Everything from marketing to set design to the old music playing on the radio totally served the illusion that this was a schoolhouse abandoned in the mid 50’s. The shear amount of props was astounding: tables, shelves, lockers and workbenches mounded high with every detail to set the stage. It was not the big things so much as the massive quantity of little things and their realistic display that completely amazes. Coupled with the well thought out design of the event in general, this certainly is a must see event. Perhaps one year soon Midwest Haunters will go back to this show, I for one am very eager to see the live performance and come face to face with Charlie himself in the dark basement of the Dent Schoolhouse! Haunted Houses in Cincinnati, Ohio are some of the scariest haunted houses in America. Hauntworld.com tries to review only the best haunted houses in Cincinnati, Ohio. When you are looking for simply the best, scariest, haunted houses in Ohio there is no other place to search than Hauntworld.com which offers our guests the best information to find Ohio Haunted Houses including the best haunted attractions in Cincinnati. There are many haunted houses in Cincinnati that claim to the best haunted attraction but only one can truly lay claim to the being the scariest haunted house in Ohio... 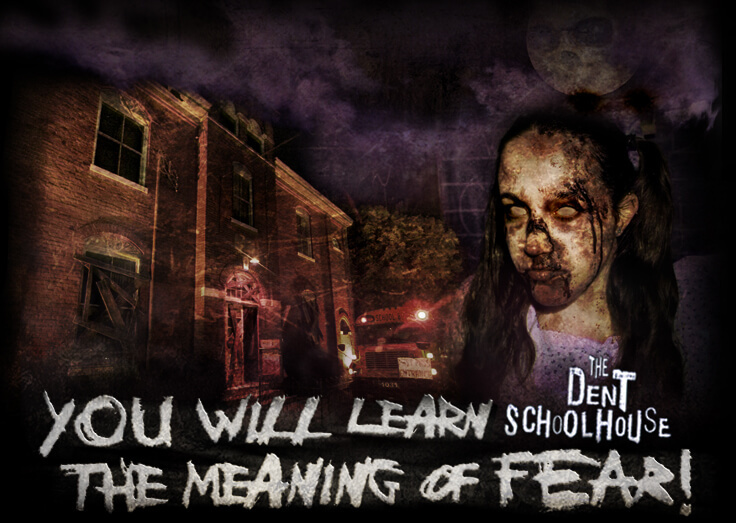 The Dent Schoolhouse Haunted House in Cincinnati, Ohio.